The fragrance collection by Karl Lagerfeld. Fashion flows from Karl Lagerfeld with the ease that rain falls from above. When the sky seems immobile, he senses the vibrations in the air. He decides on the weather, then gently blows the trend. He has a divinatory eye, a free spirit and a precise hand. With him, today is already tomorrow. Clothes, accessories, photos, books, objects... His infinitely rich and perfectly coherent world defines new borders for our own. Conventions, surplus and complications are tossed aside. Instead, a new world is invented where sophistication and simplicity go together. Because he hates all that is pompous and excess, he goes straight to the point. Through his creations, and on himself, he models elegance and modernity, and helps us to choose. The antidotes to frenzied, frantic excess: the capsule wardrobe. It is just as short, just as clear, just as easy. It refreshes the art and the pleasure of fragrance. Light, Floriental, Woody... In three fragrances, Karl Lagerfeld interprets the major fragrance families, recreating for us an ultra-simple and luxurious olfactory dressing room. As chic and accessible as a capsule wardrobe, and just as rich in possibilities. An avant-garde concept illustrated by three exquisite and carefully composed fragrances. You can use one, exclusively. Or wear three in a row. Choose them to match how you're feeling or what you're wearing. Is this simple and perfect concoction falsely modest or... worse... a libertine ingénue? This sensual and unexpected scent beckons you to the surprises of love. It has stripped down the slightly heavy construction of its original family to reinvent its identity. More modern and subtle. With ravaging incandescence, it prefers the diffuse heat of the skin. It presents itself with distinction: green, acute, ivy leaves give it structure. And, ever so tactfully, it imprisons you in a fatal accord of violet and black tea leaves. It cannot be accused of lacking elegance. But who can resist its exquisite and languorous beauty? Intrigue them. Cover your tracks by being yourself more than ever before. Move from shadow to light. From bark to pulp. Play it dry and show your tender side. Finally, keep one thing in mind: refinement. Pure lines and originality... the Kapsule bottles are in total harmony with the fragrance held within. Transparent for Light, deep red for Floriental, shimmering green for Woody. Elegant and unexpected, they fascinate by the highly elaborate simplicity of their shape, imparting a comfortable sense of intimacy to the hand that holds them. Unique objects of beauty, they indulge in the restrained luxury of a stopper and label in matte gold. These constant companions also come in a small size to follow us wherever we go: a profusion of mini-bottles exuding irresistible charm. The man who desired and crafted them for us is also present. His signature is embossed on the glass bare. There's no doubt: we have entered the world of Karl Lagerfeld. 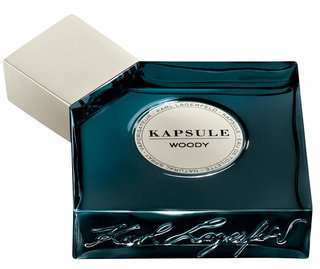 The Karl Lagerfeld Kapsule bottles are available from selected David Jones stores from 1st of March 2009 then rolling out to select MYER stores one month later. Call 1800 812 663 for Stockists.